A gazebo is typically a freestanding roofed pavilion that provides an area of shelter or decoration in a garden. Hiring a carpenter to construct a gazebo from scratch can often be extremely pricey. A much more affordable and convenient version is to use gazebo kits. 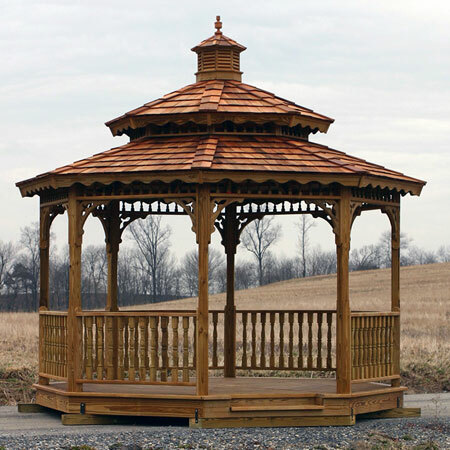 Alan's Factory Outlet Amish Wood Gazebo kits are delivered in VA and WV. 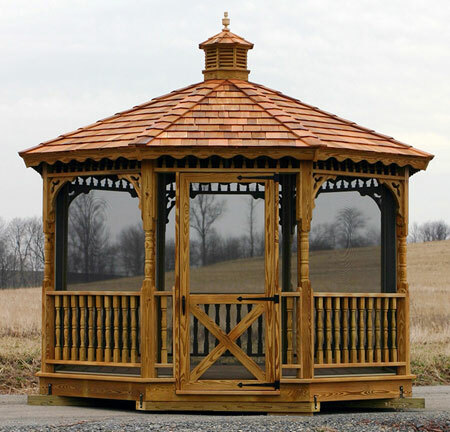 Wood Gazebo kits come in Octagon or Oval with a single or double roof. 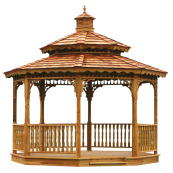 The octagon wooden gazebo kits take on the shape of most traditional gazebos. The oval wood gazebo kit, by comparison, have a more elongated shape, offering more space inside. Our wood gazebo kits offer many different sizes and options. All Wooden Gazebos are made with Pressure Treated Wood. Wooden Gazebo kits are all precut and packaged with step-by-step instructions for easy assembly. Since the kit pieces are precut, they do not require any further cutting during the assembly process. The provided kit can be pieced together for a perfect precision fit. Only a few basic tools are required to put the parts together. This includes a power drill, hammer, tape measure, and so on. It is recommended that you have someone to assist with the assembly when you set up your cedar gazebo kit. Wooden Gazebo kits have many options such as screens that come with a screen door, Turned 4x4 Post, Scalloped face board along the roof line. A Cupola and Turned Railings are Standard on all Gazebo kits. These great optional features mean that customers can customize their wooden gazebo kits to their liking. They are delivered by tractor trailer curbside. It is the customer’s responsibility to unload the gazebo kit. We recommend having a second person to help you unload it since the gazebo kits can be somewhat heavy. Oval Gazebo kits come with supplemental instructions. You will need to refer to the standard instructions included in the gazebo kits for most of the assembly but from then on refer to the oval gazebo instructions for the slight difference in the installation process. Amish Wood Gazebo Kits come with architectural shingle roof. The wood used for our wood gazebo kits is particularly beautiful, with the subtle, pleasant woody aroma of wood. After setting up their wooden gazebo kits, most people typically furnish it with patio chairs and a table, to provide a sheltered sitting area outdoors. However, the gazebo kit floors are also strong enough to hold a hot tub or Jacuzzi. The screen package that can be included in the wood gazebo kits is great to help keep the bugs out so you can enjoy yourself comfortably. Vinyl and Wood Gazebo Kits are built in 16', 18' and 20' Gazebo Kits. These gazebos are 12 sided instead of 8 sided like the 8', 10', 12' and 14' octagon gazebo kits. The number of people that you anticipate regularly hosting inside the gazebo will likely dictate the best size required. Before ordering, do take some measurements in the outdoor space where the gazebo will be erected to ensure that there is adequate space for the structure. For customers who do not wish to put together their wooden gazebo kits, we also make the gazebos available fully assembled. This is a great time-saving option that allows you to enjoy your gazebo right away! Pergola kits and gazebo kits are delivered for free to Virginia and West Virginia. All Amish Gazebo kits come with a step in for easy access and safety. They come with a Floor and are available without a floor. Stain can be added to your Gazebo kit at the Factory. For stained wooden gazebo kits, please let us know your preference at the time of placing your order. 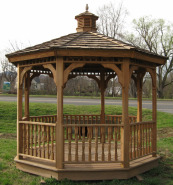 Free delivery on the wood gazebo kit to VA and WV.